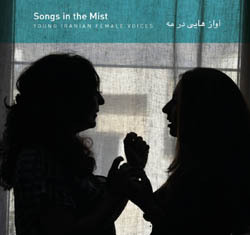 Songs in the Mist convenes eight Iranian vocalists and five instrumentalists for a multifaceted celebration of song. Above all, it's an opportunity to experience the powers of voices which, in their homeland, are forbidden to be heard solo. This makes the efforts of producers Erik Hillestad and Mahsa Vahdat even more significant for providing a stage on which these women might undo cultural shackles to let their individuality be known. Underlying these melodies are the decorative accompaniments of kamancheh, qanun, and upright bass, among other instruments. The long-necked tar grounds “Masnavi Shoor” (sung by Maryam Lamei) and “Avaz e Esfahan” (sung by the mononymous Yasaman) with its tactile nature, while percussion and qanun spark the underlying urgencies of “Morgh e Sahar” (sung by Mahsa Azimi). Sometimes the singers accompany themselves, as does Nelia Safai, playing baghlama on “Nena” and “Shopeh.” Both are sung in the language of Iran's Mazandaran region, and performed with such patience that one cannot help but sense the fertility that enlivens every syllable. Hence, the greatest value of Songs in the Mist, which by its variety of location and vocal delivery communicates an undeniable truth: that these women are more than what they express, but are also what they impress. Whether in Sahar Mansourzadeh's sharper delivery of 13th-century poetry (“Avaz e Afshari”) or in Parand's unaccompanied rendition of a 12th-century poem by Saadi (“Farewell”), the soul of each artist accounts for a unique intersection of personal and ancestral experience, all the while tanning the ear with vocal sunlight.